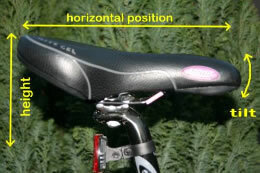 Your saddle can adjust in three ways. 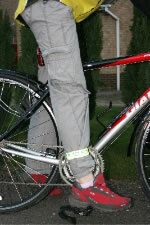 Most have a simple allen key under the seat and a clamp or a quick release on the frame. 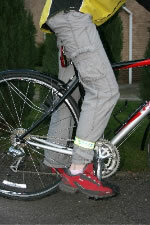 Adjust the height so that your leg is slightly bent at the bottom of the pedal stroke. There is a lot of personal preference to handlebar adjustment, which varies greatly between body shapes, so it is worth experimenting to find a setting that works for you. The ideal handlebar adjustment is the position where you can ride comfortably without putting strain on your back, shoulders or wrists. Road bike: on a road bike, the top of the bike’s handlebars should be a bit lower than the top of the saddle, in the range of an inch or two. This allows for a definite forwarding-leaning, more aerodynamic ride. Mountain bike: on a mountain bike, the handlebars will often be set even lower, perhaps three to four inches below the saddle. The point in this is to provide a low centre of gravity, particularly if you’re going to be riding off the pavement. so as to give a lower centre of gravity. Also, mountain bike riders often come out of the saddle to negotiate bumps, logs and other obstacles, and the lower handlebars provide a better, more balanced position in distributing the rider’s body weight across both wheels. Hybrids and Cruisers: With these bikes, where you’re sitting much more upright (in contrast to road and mountain bikes) the handlebars will be raised correspondingly higher, approximately an inch or two (or more) higher than the seat. This means much more of your body weight will be borne by your rear, instead of your shoulders, wrists and arms.